The Confluence: This luxury high-rise takes its design cues from the surrounding Cherry Creek and South Platte River. Rising high at 2166 15th Street in Denver is The Confluence, an ultra-luxury, 34-story, 288-unit apartment community, aptly named because of its unique location at the confluence of Cherry Creek and the South Platte River. 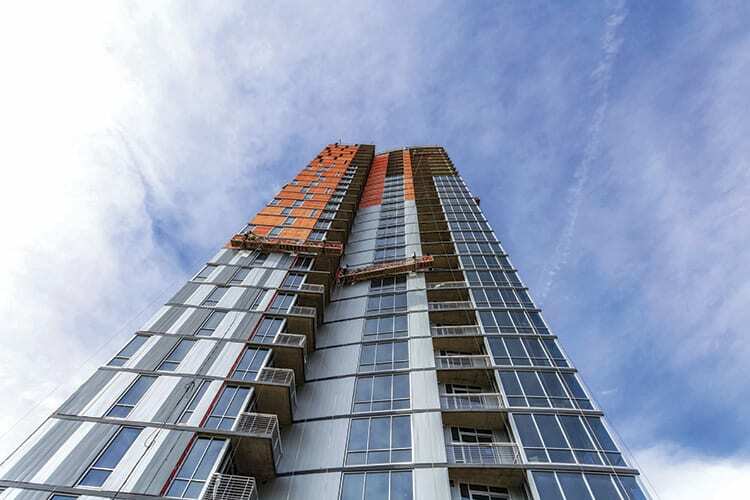 The three-building lineup of high-rise, low-rise and midrise is a dazzling mix of curves, glass, metal and masonry. And its location in the Central Platte Valley is as historic as it is ideal. Residents of The Confluence will have immediate access to Confluence Park along with its trails, benches, pedestrian bridges and water overlooks. two- and three-bedroom apartments, along with two top-floor penthouses. Many apartments and the two penthouses will have direct elevator access and monthly rents will range from $1,500 to $12,500. And it’s all quite a remarkable transformation for this legendary piece of land. The historic significance of the land at 15th and Little Raven cannot be overstated and it’s rich with Native American and Denver history. According to Tom Noel, history professor at the University of Colorado Denver, originally the land belonged to the Southern Arapaho under the terms of the 1851 Treaty of Fort Laramie. For decades earlier it had been their winter home, but when gold was discovered in June 1858, Chief Little Raven and his tribe were pushed out as scores of prospectors and fortune seekers overwhelmed the area with tents, lean-tos and crudely constructed log cabins. The first “store” in the camp opened there Oct. 29, 1858, and less than a month later Denver City was founded, named after Kansas Territorial Governor James W. Denver. For the next 159 years, the location became an underutilized mess of rail yards, warehouses and strewn garbage. Now it’s a gleaming testament to Denver’s rise. From 2007 to 2009, developer Ray Suppa – of Palace Lofts and Waterside Lofts fame – worked with the city of Denver and the Urban Land Institute to change the zoning from R-MU-30, which required a boxy LoDo-style building envelope no higher than 90 feet tall to PUD (Planned Urban Development) zoning, which would push the density upward and allow for a high-rise up to 350 feet. Suppa sold the land to PMRG in 2013. With zoning already handled by Suppa, PMRG moved fast on design. Steve Kelly, the owner’s representative, watches over the final stages of the project. But that iconic location, while challenging, set the tone for the design. Breathtaking views are just one of the many features of The Confluence. According to Gromatzky, some of the inspiration for the design also came from the zoning lines that were established years earlier. Ground was broken in late November 2014 and Ray Suppa suggested PMRG host a Native American blessing, something he had done in the past. Given the site’s historic significance, Nail agreed and Benito Concha, a Taos Pueblo medicine man, performed a blessing ceremony at the ground breaking. The Confluence makes a bold and beautiful statement in the Central Platte Valley. At the ceremony, Concha presented Nail and his team with a cedar bough, a symbol for purity and cleansing to be kept until the building is finished. That cedar bough still sits in Nail’s office on-site. According to Nail, Concha was back at the topping out in December and will be in attendance for the grand opening later this year. With design nailed down and the project blessed, PMRG turned to longtime partner Clark Construction to tackle the many challenges and bring the vision to life. Some of the challenges were par for the urban infill course, like staging, phasing, keeping the neighbors happy and keeping the park open during construction. Some were more challenging. Another challenge Clark faced was the layout of a high-rise next to a low-rise. Due to forecasted differential settlement issues, they were forced to leave a pour strip around the high-rise and leave it separated from the low-rise until the tower reached 26 floors. And that called for a solution that Clark Construction, builders of Chicago’s Midway Airport, Washington, D.C.’s African American Museum, Nashville’s Music City Center, as well as the Denver Central Library, had never used before. Arapahoe people at this location. The tower is skinned in high-performance glass and random metal panels of blue and white, which gives the hint of falling water. Come nightfall, a series of white LED lights run down the side of the building to create the sense of water cascading downward. The lights will also be programmed to go solid blue and orange during Broncos games and other special events. Inside, the high-rise is loaded with luxury features and amenities. But, no doubt the biggest draw is the breathtaking views of the Denver skyline and/or the mountains from almost every floor. And the views from the two penthouses are truly spectacular. When you’re looking down on Elitch’s Observation Tower, you know you’re pretty high up in the sky. The low-rise spills out from the base of the tower and connects to a six-story midrise of more luxury apartments. The low-rise will feature four stories of apartments, along with common area amenities that include a large terrace with pool, cabanas for lounging, fire pits and heated spa. Inside amenities include a tenant lounge with professional-grade catering kitchen, fitness club with a large NanaWall that opens onto the park, dog-washing station and 24-hour concierge. According to the Gromatzky, zoning rules helped create one of the more interesting architectural features of The Confluence. “We had to bridge over a cut through that was defined by the zoning diagram,” he says. “That cut through allows a view of the REI building and the park from the corner of 15th and Little Raven. “Over the top of that cut, though, we have a gorgeous swimming pool cantilevered out toward the park with a glass wall,” said Gromatzky. “It’s really stunning. Another public draw will be two restaurants, as yet unnamed, that will be on the ground level on opposite sides of the cut through will patios spilling out onto the park. Brick and other masonry materials are used at the base of the midrise and low-rise, to create texture at the street level, but also to mimic the use of masonry elsewhere in the area. Each apartment will have high-end, luxury finishes throughout. Nail and Gromatzky both say the building was built with sustainability in mind and that it will achieve LEED Gold certification. Nail is currently looking at sites in Denver for new projects to develop. 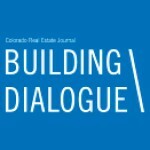 And according to Gromatzky, “We see Denver really coming on now as a real estate power. The city has done a great job of continuing to foster beautiful neighborhoods, work with their parks department, pay attention to their open spaces and protect their historical venues that are treasures for Denver.